Fireworks erupt over the stadium during the Opening Ceremony for the Baku 2015 European Games at the Olympic Stadium on June 12, 2015, in Baku, Azerbaijan. 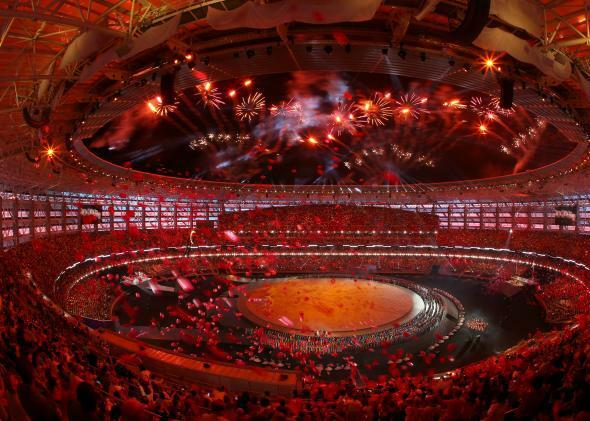 The first ever European Games opened in Baku, Azerbaijan, today with a lavish opening ceremony at a brand-new, $600 million stadium featuring a performance by Lady Gaga. But most of the international headlines around the event are focused less on sport and spectacle than on the deplorable human rights conditions in Azerbaijan. The European Games is an Olympics-style tournament organized by Europe’s national Olympic committee. Azerbaijan has paid the full traveling expenses of more than 6,000 athletes from 50 countries to attend. Most of the events are familiar from the Olympics, although there are also some unique sports including Beach Soccer and the Soviet-developed combat sport Sambo. That the event would be a human rights disaster has been obvious since it was first awarded to the oil-rich dictatorship in 2013. President Ilham Aliyev, who is also head of the country’s Olympic committee, has ruled Azerbaijan with little tolerance for dissent or free speech since taking over from his father in 2003. But things have been even worse than expected. In what Human Rights Watch calls “an atmosphere of government repression unprecedented in the post-Soviet era,” more than 40 activists and journalists investigating corruption and mismanagement in connection to the games have been arrested. Amnesty International, which has tried to bring attention to the cases of those detained, was barred from holding an event in the country. Journalists from a number of foreign outlets, including the chief sports correspondent of the Guardian, have been blocked from entering the country. Most European heads of state have avoided the event, though a roll call of local autocrats, including Russian President Vladimir Putin, Belarus’ Alexander Lukashenko, and Turkey’s Recep Tayyip Erdogan, were in attendance at the opening ceremonies. If it’s any small consolation, there’s not much risk of that. The games that Azerbaijan reportedly spent more than a billion dollars staging have only highlighted its abuses, particularly coming just after the recent scandals involving the upcoming World Cups in Qatar and Russia have drawn more attention to the cozy relations between international sporting bodies and the world’s most repressive regimes. As if compounding the travesty, the festivities surrounding the opening of the games have been marred by an accident, captured on graphic and disturbing video, in which a bus plowed into a group of junior athletes, seriously injuring three Austrian synchronized swimmers. In contrast to the genuinely entertaining World Cups and Olympics recently held in dictatorships, the actual athletic competition may be something of a bust as well. The games have failed to attract most high-profile track and field and swimming stars. Perhaps sensing the writing on the wall, the Netherlands, the only country bidding for the second European Games in 2019, announced this week that it is withdrawing its bid, increasing the odds that much-heralded event may be a one-off. That’s probably just as well.